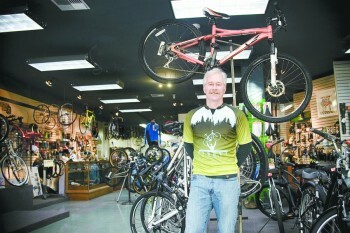 Patrick Vala-Haynes shares his thoughts on road cycling in the Yamhill Valley. We asked Tommy’s Bicycle Shop owner Patrick Vala-Haynes to share his thoughts on what you expect when road cycling in the Yamhill Valley. Heart-thumping climbs, narrow roads, glaring sun, icy rain, and a headwind that defies the compass. Three flat tires in the first hour, a thrown chain and a dead crow. Ah, spring riding in Oregon. If you’re not having fun by now, you should give up cycling and take up anger. Some people have suggested the aerobic benefits are similar. Or you could come ride the roads of Yamhill Valley on a soft summer evening. You might get a little wind and a bright sun, your heart might end up in your ears, but the choice will have been yours. Some of our roads are quite narrow, but you will also find our best rides have very little traffic. Our roads aren’t always the smoothest, but you’ll be better off focusing on the four deer crossing in front of you. Notice how they expect you to wait. If you ride late in the season, you can gorge on blackberries growing wild along the roads. Actually, all you have to do is breath on a warm day and you’ll think you had a great meal. Spectacular terrain—whether you want vineyards, wetlands, or a climb that reminds you that breathing is not to be taken for granted—is available north, south, east and west. If you are using McMinnville as your base, you can find 11 suggested ride routes at www.tommysbicycle.net, varying in distance from 7.5 to 69 miles. Two excellent rides, the Youngberg Hill (13.6 miles) and Muddy Valley (26.1 miles) loops, will take you through farms and grassland on country roads. Slight variations will bring you to wineries and steep climbs through vineyards. While a few of the listed rides include heavily traveled highways, they are used sparingly and then only to connect to quieter roads. Bring your bicycle and a friend. Ride. Bring your appetite. Bring your thirst. Feed and quench. Repeat.